Vast, endless and breathtakingly beautiful, a natural world full of pine, spruce and birch trees, shades of greens and a rugged undergrowth that tempts exploration. A picture perfect image of a forest, but this is no book this is the view from the Inlandsbanan Train, a train ready to take you on a journey so unique it will feel like you are travelling in your very own fairy tale story. 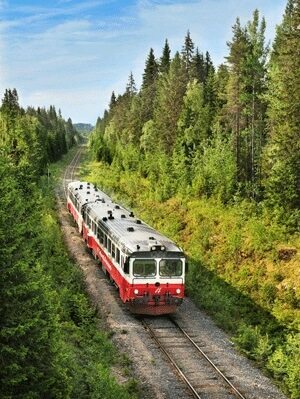 The Inlandsbanan train travels through the central parts of Sweden crossing the Arctic Circle into the land of the midnight sun. A relaxed method of travel that is very much about taking a moment to slow down the pace of life and experience losing yourself in the beauty of nature and escaping into a world so natural and pure. The train meanders 850 miles from central Sweden to Swedish Lapland and with Planet Rail you can experience this wonderful environment travelling from Östersund Station to Gällivare. This rail adventure is very much about slowing down the pace of life and allowing yourself the time to relax with friends and loved ones. Embrace the peaceful and quiet atmosphere that travelling on the train allows, and while travelling in comfort embrace the simpler things in life and take a break from technology and the busy pace of life we are all so accustomed to. Prepare yourself for this journey for it will be unlike any other, spontaneous stops along the way allow for plenty of photo opportunities as well as strawberry picking and even a swim in a cool lake if you fancy a freshen up. The possibility to see wild animals is high so keep a look out for owls, birds of prey, bears, lynx, wolfs and wolverines as they all make the forests their homes. While on the train food and drinks will be available but regular stops are scheduled in to allow you to experience new places and try local specialities of Inland Sweden. The train journey also allows you to explore in more detail the history of these areas and includes a stop at Sorsele where you can visit the Inlandsbanan museum, a museum brimming with a history that will take you back 100 years. You can also discover the work and social life the navvies led at the Moskosel Navvy Museum. Part of the journey includes a stop at the geographical Arctic Circle just south of Jokkmokk where you can capture the memories of this exciting experience. As you pass north of the Arctic Circle you enter the land of the midnight sun, where the sun is visible at midnight during the summer months. In the winter you can see magical Auroras that light up the sky, so no matter what time of year you travel you can enjoy a wondrous experience that is totally unique and breathtakingly beautiful. Travelling on the Inlandsbanan Train is very much about meeting new people from all over the world and sharing stories and memories, embracing trying something new in life, relaxing and most importantly slowing down.